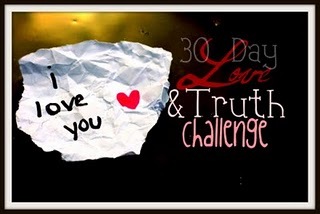 30~ Did this love challenge teach you anything? If so/not...what/why? When I started this challenge, I thought it was going to be easy. How hard could it be to tell my stories of love, to share with others? However, I must admit I was sorely mistaken. There were times when I seriously wanted to utilize a SKIP or a PASS button. On some of the entries, as I was writing, the feelings associated with the person and/or events started to get to me. I remember having to step away from the computer and going for a walk. Then, I came back to it and was able to proceed. At times, I broke down in tears and/or felt my heart race. Wounds I thought had scabbed over beginning to peel away, flakes of memories exposed. I knew the only way I could reseal the wounds was to continue to write--to tell my story; if someone else read it, the person could realize she wasn’t alone. Also, if I pressed on, it would show that although these things hurt, the memories could not hold as much power as they did if they continued to be suppressed. I learned how the way I loved could be taken advantage of, manipulated, disrespected, discarded. I figured out, in some cases, the hard way, what happened when I didn’t heed the lessons of the last failed relationships. I discovered my early fallacies…of feeling like I needed a relationship with another person when the star player should always be me. No person, no matter how good or near perfect he is, can implant the Love one needs to sustain self. I’m glad I did this challenge. I don’t think the me of three years ago, two years ago…heck, even six months ago would have taken this on, so thanks for the chance. I found courage in me I didn’t know existed. Thanks to everyone who followed me, even if you couldn’t get to read everything. I can get quite long winded in the tapestry that is my life; I’m not really for those who like everything short and sweet. Take care; I hope everyone gained as many lessons…if not more, than I did.